At CustomInk, we use a variety of tools to monitor the status of our builds. One such tool was Greenscreen. In fact, we even wrote a blog post about how we use Greenscreen at CustomInk not too long ago. One of the biggest problems with Greenscreen was its extensibility. By default, Greenscreen only works with Hudson and Jenkins servers. With Travis CI becoming quite popular in the open-source community, Greenscreen needed a major upgrade. Furthermore, Greenscreen was not very extensible. # doesn't care who it's talking to, as long as it guarantees certain information. On the front-end, now we don't have to worry about parsing different server responses; we know that any provider will respond to the Provider#projects instance method. This makes refactoring our front-end code much easier. This set of simple instructions tells a provider how it must format data. Essentially this makes Provider a micro-data-mapper, massaging data from remote APIs into a standard format. Stoplight then uses that standard format to create a unified user experience. Since Stoplight is destined to become an open-source project, it needs a comprehensive test suite. Furthermore, during our refactoring, it's important that we don't break existing functionality. As such, I added a full test suite with RSpec. To make development easier, I also use Spork, Guard, and Growl-Ruby to automatically run tests in the background while I'm coding. This makes TDD much more exciting. Under the hood, all the styles for Stoplight are generated by a framework called Compass. Compass allows us to leverage the power of SCSS and easily create a cross-browser compliant application. Stoplight uses Compass and SCSS for all it's styles. This ensures a consistent user experience. ABAP stands for "As Big As Possible". A tiny snippet of jQuery dynamically sizes text to fit in its bounds. Whether you're displaying on a 60" LED TV or a 13" Monitor, the text will be as big and clear as possible. Brace yourself for a meta-moment. 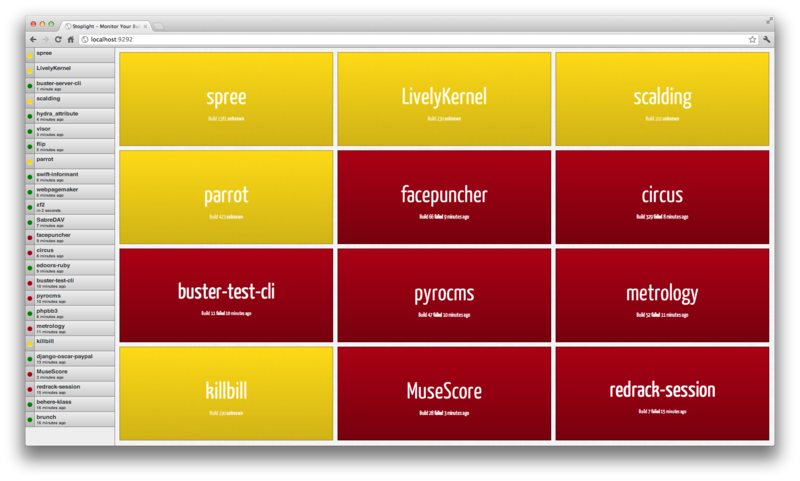 Since I wanted Stoplight to become a popular open-source project, I added the build on Travis CI. With Stoplight on Travis CI we can use Stoplight to monitor the build status of Stoplight. There you have it! What was once a very isolated and less-than-configurable tool is now highly extensible and open to contributions by the community. If you are currently using Greenscreen or another build monitoring alternative, give Stoplight a try. Stoplight is available for download and forking on github. Pull requests are greatly welcome! There is also a highly-configurable chef cookbook for installing Stoplight on Apache and Passenger on your own servers.